EH&S presented posters showing three distinct process improvements at the TAP Showcase on March 6, 2018. The changes are intended to create efficiencies and improve customer service in our Lab Safety Survey Program, Hazardous Waste Collection service and Radiation Safety Survey Program. Professionals who have some radiation safety job responsibilities may be interested in a one-time radiation safety course offered by the UW Environmental and Occupational Health Services Continuing Education Programs. Please note that this course does not meet the requirements of EH&S radiation safety training. For more information about EH&S's free online and classroom radiation safety courses, please visit our Training page. The Laboratory Safety and Compliance course is changing in response to attendee suggestions. The reality is that the clock is ticking … your time is valuable and you’re on deadline, but you don’t have time to not manage safety in your lab. PIs and Lab Managers who avoid taking the time up-front to implement safe work practices often spend valuable time managing lab safety after an incident occurs. When it comes to lab safety, you don’t have time to not mitigate hazards. 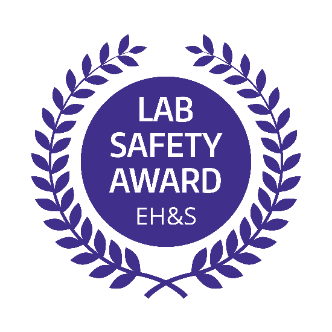 Labs that receive a rating of 85 or higher on their most recent lab safety survey earn a Lab Safety Award. The Chemical Hygiene Officers (CHOs) are assigned by Principal Investigators to support lab safety programs, and are often responsible for much of the effort required to maintain a strong culture of safety. EH&S now acknowledges this effort with an award certificate. Injuries have occurred while UW employees were using ladders on the job. These incidents show that using ladders can be dangerous if not used properly. Before you use a ladder at work or at home, make sure you take the necessary safety precautions. What went wrong in the recent UW incidents? A person fell off a ladder when overreaching. Someone could not find a step ladder for a job, and instead used an orchard ladder (tripod type ladder), and fell to the ground when it tipped over. The 2017 Occupational Safety and Health Administration (OSHA) 300A summaries of work-related injuries and illnesses are now posted on the Environmental Health and Safety (EH&S) website, along with summaries for previous years.